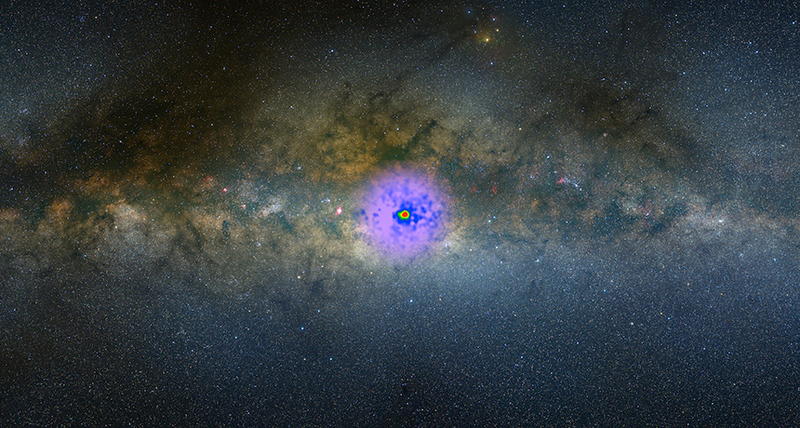 GALACTIC GLARE Dark matter probably doesn't generate an excess of gamma rays coming from the center of the Milky Way, shown here superimposed over an image of the galaxy. An astronomical calling card, tentatively attributed to mysterious dark matter, seems likely to be due to a more mundane source. An unexplained glow of high-energy light from the center of the Milky Way, first spotted in 2009, raised scientists' hopes of better pinning down dark matter (SN: 11/20/10, p. 11). That unidentified substance has been detected so far only via its gravitational tug on other matter. Physicists thought that this excess of energetic light known as gamma rays might be released by the annihilation of particles of dark matter that mill about the galaxy's core (SN: 5/17/14, p. 8). But an analysis published August 6 in Nature Astronomy suggests that the light isn't from dark matter after all. Instead, the gamma rays might be spit out by other galactic denizens, such as spinning dead stars called pulsars that are known to produce the light. The scientists studied the distribution of the gamma rays to get a handle on the light's origins. Dark matter is thought to shroud the Milky Way in a featureless, spherical halo. But stars within the galaxy are distributed differently, residing in a thin disk with a bulge at the center of the Milky Way. The regions of the galaxy that the gamma rays are coming from match up better with the distribution of stars than that of dark matter, the researchers found. Other recent studies have likewise raised doubt that the gamma rays are due to dark matter (SN: 5/27/17, p. 15), casting a shadow on scientists' bright hopes.